First Epistle from Masala. Scarborough Marina, Redcliffe Peninsula, Brisbane, and the Moreton Bay area. Sorry it has taken so long to send an e-mail about what we are up to, but we have been flat out working on the boat and falling into bed exhausted every day. Now we are getting on top of things and we hope a more normal life with better communication will begin. We had the boat hauled out of the water back in March. We spent five days sanding the hull, painting on the new antifoul, painting the propeller and drive shaft, and replacing the zinc anodes that help protect the steel hull from corrosion. 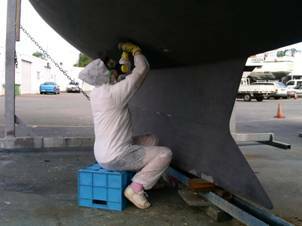 Sanding the old antifoul and applying the new stuff is a messy job, and great care needs to be taken to avoid contact with the paint and paint dust as it is highly toxic – after all, it is designed to kill marine growth. Thick rubber gloves, disposable overalls with hoods, safety glasses and respirators were the order of the day. It is not a fun job but at least we now have an intimate knowledge of our hull which should stand us in good stead for the future. Most of this work is overhead as the boat is sitting on its keel. The effort of working overhead plus the pressure from using a long handled paint roller did Leanne’s back in. So the cost of a chiropractor’s visit got added to the job. She is fine once again. 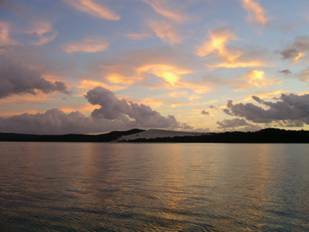 A great spell of weather saw us leave the marina immediately for 4 days relaxation. 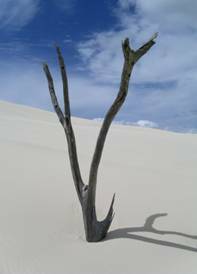 We sailed across to The Sandhills on Moreton Island, stayed two days, and sailed back. This was our first time out overnight on Masala. It was wonderful. A huge mountain of sand spills from the island into the water. We climbed to the top for great views over Moreton Bay and the ocean. 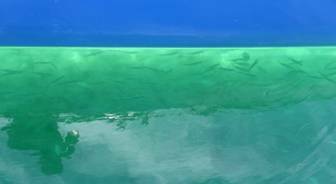 Over the shallows at high tide, in the dinghy, we saw turtles, stingrays, shovel-nose rays and lots of very large and hungry garfish. A school of more than 100 fish, all the same unidentified species and about 20cm long, moved in to live under our hull. Whenever I went snorkeling under the hull they came over to play, surrounding me in a living whirlpool of silver and yellow. It was divine. Back in the marina the work continued. I changed the twin fuel filters and the engine oil and oil filter. I had never done this before but did a lot of reading beforehand and wrote one of our detailed SOPs (Standard Operating Procedures) before starting. Fortunately, no dramas with this lot.